Tech director Daniel Ramey controls sound and lighting. Viewers as far as Germany and Brazil have viewed the Oro Valley church's services. When Oro Valley Church of the Nazarene holds Sunday services, people around the world can watch. Capturing and broadcasting its sermons with six cameras and thousands of dollars' worth of cutting-edge equipment, the technology-friendly church streams services online, as well as through Internet-connected Roku boxes, which many customers use to stream Netflix movies on TV. Churchgoers can pick up a DVD or Blu-ray copy of the service after it's over, and can go to the church's website (ovcn.org) to watch broadcasts. Under the direction of Pastor Craig Coulter, Worship Pastor Larry Vinyard has led the church's transformation into a technological dynamo. "We use four to six cameras per service, and we try to capture the crowd response from time to time," Vinyard said. "We try to video in such a way that those watching feel they are part of the congregation and not just a person at home on a computer watching a sermon or small group on stage performing. I'm not sure how successful we are with this, but it is definitely one of our goals." Vinyard said the efforts are all about spreading the church's message to as many people as possible. "It adds another way people can access our services if they're not able to come," Vinyard said. "We have an older lady who's a shut-in, and we set up Internet at her house. Now she streams with us Sunday mornings." Viewers as far away as Germany and Brazil have viewed the church's services, he added. Vinyard, 61, pointed the church on the path to online prominence five years ago, when he began filming services with his own video camera. Within two years, the church started streaming services online, upgrading its equipment and production value as it went. 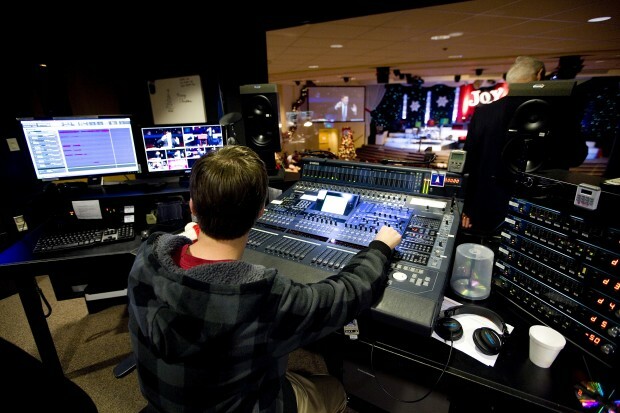 In 2011 the church invested $70,000 in upgrading equipment to HD standards. Earlier this year it spent $60,000 for high-definition screens and projectors. "We just kept building from that point," Vinyard said. "We started with nothing and kept building. We came to a point that everyone was switching over to HD, and we couldn't get by with our SD (standard-definition) stuff anymore." Currently, church officials use as many as six cameras to capture services, with a dedicated video director behind the scenes instructing personnel on which feeds to air at a given moment. The church has been streaming on Roku for six months. Vinyard said the church will continue to look for new ways to expand its reach. "We're anxious for more of those projects. We enjoy doing them," Vinyard said. "One type of project I especially enjoy is capturing video testimonies from our people, who share something happening in their lives. Short, sweet and interesting, with good lighting and good video. Short vignettes. I'd like to do a lot more than that. "We've built a lot of infrastructure, and now we can move on to producing interesting video projects." To watch an Oro Valley Church of the Nazarene service on Roku, select the channel store and search for "OVCN" in the religion category. You can select "Live Service" to stream a live broadcast or "On Demand" to view an archived recording.